You probably know by now that I love to read all the time. I read too much for my own good. Wait, no. There’s no such thing as too much reading 🙂 Haha, who am I kidding. Ever since I got my Kindle 6 months ago I have been buying books obsessively on Amazon. It’s like.. an addiction. I freaking love it. I’ll browse through it while laying on my bed, thinking about what I wanna read next, and BOOM – I can be reading that new book in a minute. It’s heaven! So that’s precisely what happened here. I got this book for my Kindle so I could read it in my spare time. I’ll be honest – most of my reading I do is non-fiction – more business, marketing, and personal development books. Whereas I leave my novels for the cardio machines so that I can have the time go by faster and I can get more engaged in what I’m reading. That was the plan for this book too. 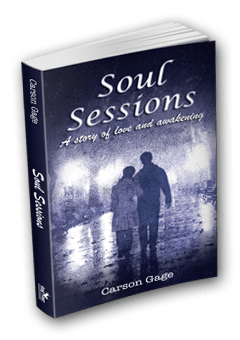 About the author: Carson Gage has been interested in the mysteries of life and death since the age of seven, when he survived being run over by a speeding car. This experience led him on a journey of discovery for answers to some of life’s biggest questions. What I thought about the book? It was interesting. You know how I mentioned I like to read about personal development (and spirituality) but also like novels? Well this was almost like a hybrid. It had a lot of the learning educational pieces in it, along with a nice plot and story which made for reading it a lot more pleasant. I did like the book. I wasn’t totally convinced at first because it almost sounded like the author was a hypnotist or a counselor or something and was trying to sell you on then wanting to do these types of sessions too (might be a good marketing thing) but then I realized that’s not the case. And the book was genuine. And from there, it made me really like it. I’ve already done hypnosis before and I did one past life regression via pre-recorded hypnosis audio I purchased (also on Amazon) and it was interesting. I’m not sure if it was real or imagination but regardless it was a cool experience. I’d wanna do it again but with a real person. I think it can definitely uncover some interesting insights. I do believe in past lives. One of my friends is a well known hypnotherapist and she talked about this concept herself and how it can truly heal you in the current life too. That’s what caused me to wanna explore this more in the first place. It definitely made me think to consider the intuition and gut feelings a lot more. Actually feel okay by being guided by them to move forward and that there IS a plan out there for us to move along if we follow our intuition. Learning this, and reading this, made me feel more at peace.